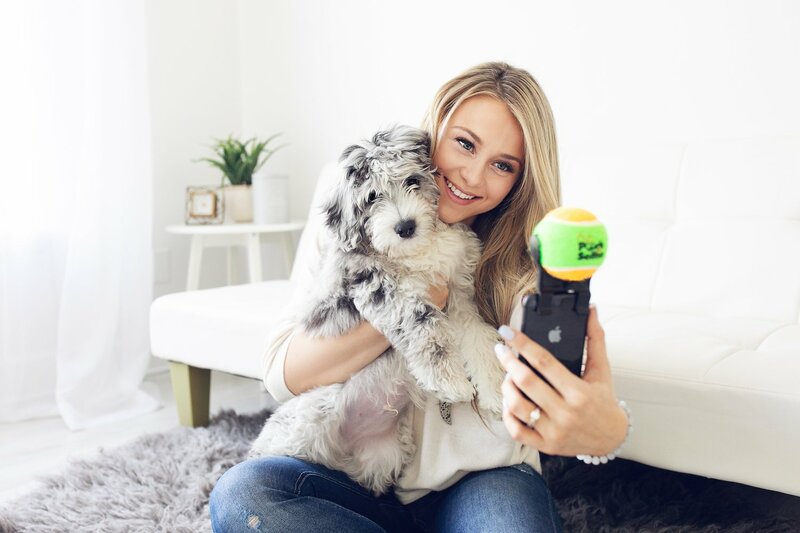 Elevate your selfie game and impress your social media followers with amazing photos of your four-legged friend using Pooch Selfie, the Original Dog Selfie Stick Smartphone Attachment. If your energetic pup seems to be in near-constant motion, capturing a photo of him can be nearly impossible! This first-of-its-kind smartphone accessory makes taking clear, focused pictures of you and your best buddy fun and easy. Simply snap the device to the top of almost any smartphone or tablet, insert the included Pooch Selfie squeaking tennis ball into the cradle to instantly get his undivided attention, and snap away using either the front or rear-facing camera. Teach your dog that posing for pictures is actually fun and rewarding by playing a quick game of fetch with the squeaky ball after every few clicks. Elevate your selfie game and impress your social media followers with amazing photos of your four-legged friend. Innovative, first-of-its-kind smartphone accessory makes taking clear, focused pictures of you and your best buddy fun and easy. 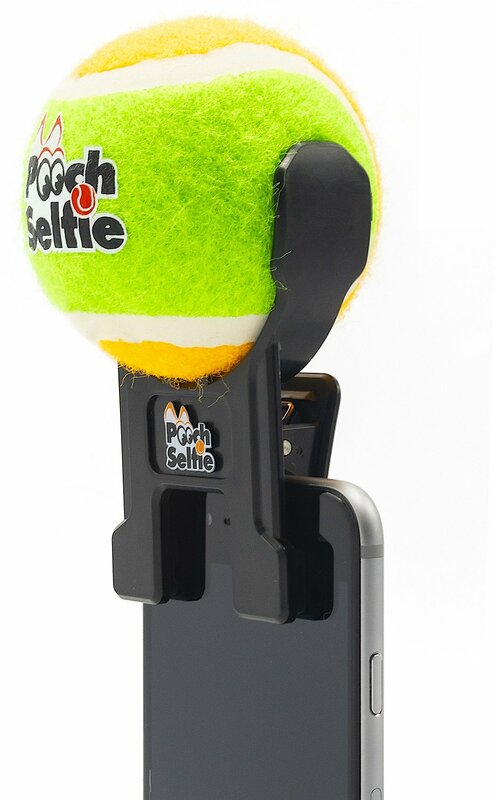 Simply snap the device to the top of almost any smartphone or tablet and insert the Pooch Selfie squeaking tennis ball into the cradle to instantly get his undivided attention. Teach your dog that posing for pictures is actually fun and rewarding by playing a quick game of fetch with the squeaky ball after every few snaps. You can substitute any standard tennis ball if the included squeaking ball is lost or destroyed. Custom smartphone attachment and (1) squeaking tennis ball. Ingestion of this product can result in serious injury. Not a child’s toy. Observe your pet's behavior with this product for suitability. Remove or replace if damaged or separation is detected. Compatible with most third-party smartphone cases excluding OtterBox, LifeProof and Body Glove. Simply slip the smartphone attachment onto the top of your phone or tablet and attach the removable Squeaking Pooch Selfie ball. Then, that’s it! Snap away! Works with both front and rear facing cameras without having to remove the device from your phone. In the simplest possible terms? Pooch Selfie is a product designed to help you take better selfies with your pets. But Pooch Selfie is not just the product; Pooch Selfie is an idea; to change pet selfies forever. Pooch Selfie is an attachment that allows you to clip one of our squeaky balls to your phone, giving you the power to focus your dog’s attention before you snap that perfect shot. You'd be surprised. Our dogs are not always quite as cooperative as we like when it comes to staying still and focusing where you need them to. It's why we invented the Pooch Selfie; it helps your dog focus so you two that perfect pic you would have never thought possible before! I saw this on Shark Tank so it has to be good...Well, although it is a great idea it has many flaws. First, it did not fit my phone because I have a case on it for protection. Second, the ball is hard to squeeze while it is on the phone and third, it falls off as you try to squeeze it. It should clip on like a clothes pin and have flat rubber pads so it clips on without scratching or damaging your phone. I was going to send it back but my daughter-in-law took it to try. I’ll check back with her experience. It defiantly works for pictures! BUT....putting it on my phone it caused the plastic screen saver to be pushed up...... AND it cracked my phone case because it was so hard to get on. If it clipped on instead of having to push it on, it would be GREAT. You don't leave it on all the time so taking it off and on is a problem. I will give it to someone that doesn't have a screen cover or a phone case. I saw it on Shark Tank that is why I bought it. Unfortunately this met an untimely death after just a few uses because a dog jumped up and grabbed it and it was no more ball and all. Not the result you want the dog jumping at you as well. I saw the pitch for this product on Shark Tank and was touched at the emotion and passion behind the product. It arrived promptly and in great condition. Would definitely buy again! Great idea to grab your pup's attention for a great shot and the ball can be replaced if needed. However, the clip does not fit onto my phone with or without its protective cover. (Galaxy Note) I am afraid if I manipulate it my screen would crack or be scratched. Would not buy again. As soon as my two Goldens saw the Pooch Selfie, they went bonkers. It took a bit to get them to sit for the photo, but when they did, they looked right into the camera phone. Love the Pooch Selfie. My dogs LOVE this ! Its helped my adoption dogs get perfect pictures sooo much easier ! You Get The Best Pics! This is such a silly invention but it works so well! I've gotten so many cute pics of my pup with this!